Subscribe to receive a free copy of my sample lesson plans here! The above products can be purchased in my shop or downloaded in my member area! Not a member? Be sure to add extra "Orange" colored Art Supplies to your space this week (Orange Paint, Crayons, Pens etc.). Add plastic pumpkin cookie cutters to this space as well. You can DIY your own pumpkin face "Stamps" out of craft foam or potatoes for some pumpkin stamping fun! 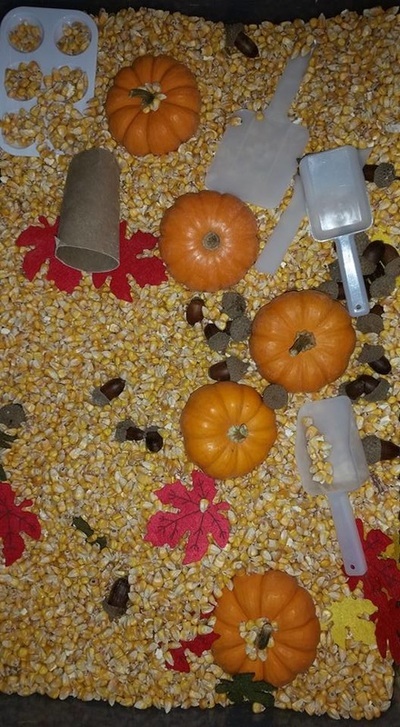 It's a great time to create your own Pumpkin Stand/Patch in your Dramatic Play Space. You can purchase real or pretend pumpkins to use in your space, or make some DIY ones from stuffed paper bags. Be sure to check with your clients, they may be overflowing with homegrown pumpkins (or might know someone who is). In addition to Pumpkins, you can also add gourds and hay bales. Don't forget a scale for weighing and a cash register. Felt in her Dramatic Play Space! 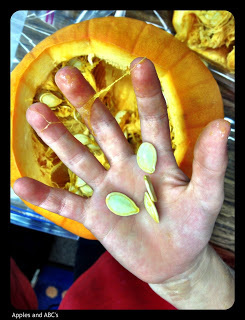 Community Member Erica P. of ﻿﻿Erica's Educare Learning Center﻿﻿ created a Pumpkin Patch inside (above) and outside (below). Paint pumpkins on some small blocks. 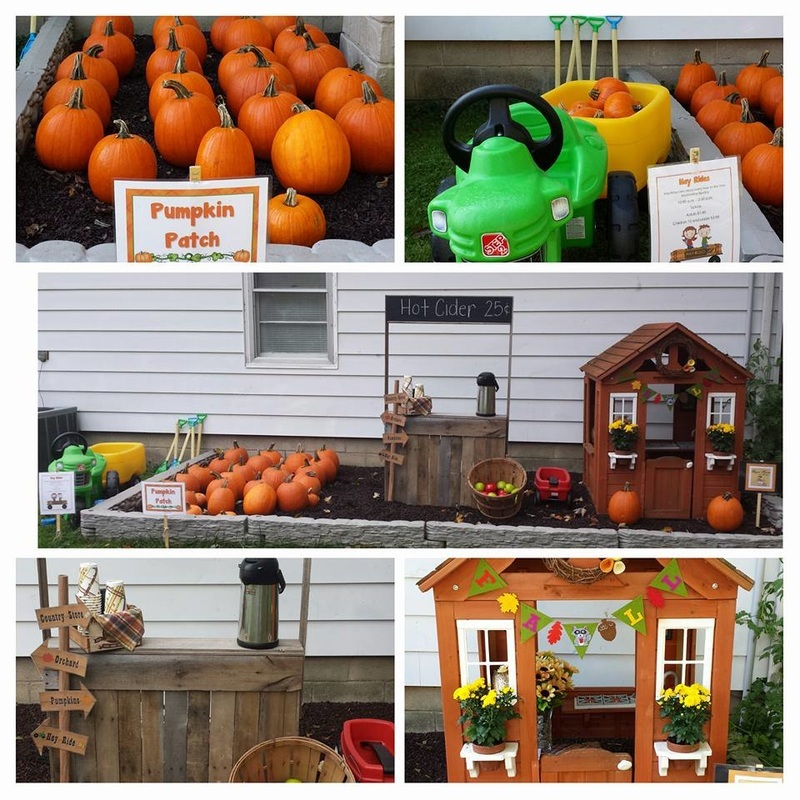 Add materials to this space so that kids can build their own pumpkin patch: pretend pumpkins, Small Hay Bales, Green and Brown Felt. Include Farm toys in your space this week. Print out some pumpkin patterns for your pattern blocks or create your own. Add pre-carved fresh pumpkins to your sensory table. 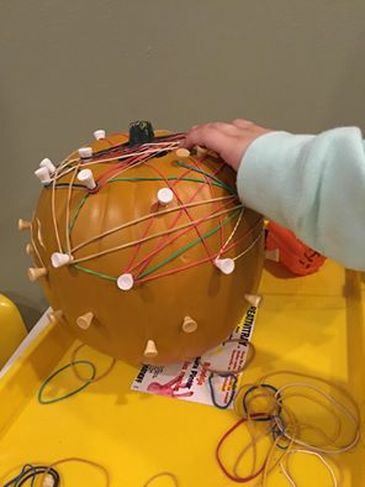 The children will enjoy exploring the insides of the pumpkins. 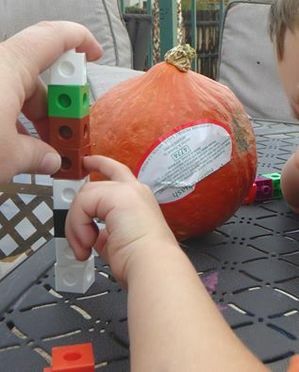 Do experiments with pumpkins. Do they sink or float?. How about some Math ? How much do they weigh?, count how many seeds are inside. Follow Melissa Solomon's board Theme.Pumpkins on Pinterest.